As-told-to memoir of life with the famous crooner by his African-American Man Friday, lubricated with racy tales about the stars, the Kennedys, and the Mob. Aided by veteran coauthor Stadiem (Too Rich, 1991, etc. ), New Orleans native Jacobs begins his story at the end of his association with Sinatra. The summer of 1968 was not a good year for Mr. S. The music world was changing, many of his Mob pals were either in jail or exile, and his marriage to Mia Farrow was in trouble—which might explain why he summarily fired Jacobs for the sin of dancing with Farrow (at her request) in a popular Beverly Hills nightspot. In subsequent chapters, the author details his Hollywood rise, which began in 1950 when he came to California dreaming of a career in show biz after serving in the navy. Jacobs first worked for noted agent Irving Lazar, who introduced him to stars like Humphrey Bogart, Lauren Bacall, and Sinatra, whose career seemed stalled until he landed an Oscar-winning role in From Here to Eternity in 1952. One year later, Jacobs was hired away by Sinatra, who not only coveted his skills as a factotum but wanted to annoy Lazar, who had treated the singer like a has-been. Jacobs describes how he became close to Sinatra, a generous if volatile employer, met his family and friends, listened to his worries about his career. Though Mr. S. had numerous affairs—with hookers and starlets as well as Bacall and Monroe—he was still obsessed with Ava Gardner, the author recalls, as he liberally names names and regales scandals. Sinatra was insecure about his background, Jacobs reveals, and his awe of the Kennedys turned to hate when he was betrayed by Bobby and Jackie, who disapproved of his association with JFK. By contrast, he remained loyal to mobsters like Sam Giancana. 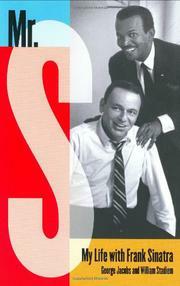 Deliciously gossipy, yet Sinatra is recalled with affection rather than spite.